Inhaling and absorbing smoke just as bad as smoking. Scientists at the University of California Riverside have confirmed what most non smokers have suspected, namely that second-hand and third-hand smoke are as deadly as first-hand smoke. The study was published in the PLOS ONE journal. First hand smoke refers to direct smoking, second hand smoke refers to smoke inhaled from the first hand smoker and third hand smoking refers to smoke that has been absorbed on object surfaces. 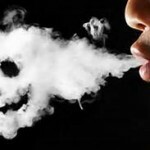 Third hand smoke increases in toxicity over time. The researchers determined that mice exposed to third hand smoke in the lab showed metabolic alteration in the liver, lungs, wounded skin and displayed hyperactivity. Third and second-hand smoke is particularly detrimental to young children and immuno-compromised individuals and contamination of homes by smokers is high both on the surfaces in the home as well as household dust. 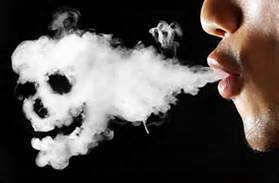 Contaminated indoor surfaces can emit nicotine leading to exposure levels that are the same as first-hand smoking. Third-hand smoke, which contains strong carcinogens, has been found to persist in houses, apartments and hotel rooms after smokers move out. ← Mediterranean diet lowers risk of heart disease.